This is SKYRACK No. 14 dated 22nd February 1960, thereby resisting a temptation to have itself dated 29th. SKYRACK is published by Ron M. Bennett, 7 Southway, Arthurs Avenuc, HARROGATE, Yorkshire, England. 6d per copy, six issues 2/6d. 35 cents for 6 issues in USA (65cents for 6 by air), subscriptions to Bob Pavlat , 6001-43rd Avenue, Hyattsville, Md. News of interest to fandom gratefully received as the cartoon by Arthur Thomson shows. Contributors: Klaus Eylmann, Peter Davies, Ted Forsyth, and Norman Shorrock and Ella Parker both by letter and by phone. TIME: Remains Good Friday 15th April to Easter Monday 18th Apr. PLACE: The Sandringham Hotel, 25 Lancaster Gate, London W.2. The Sandringham is not a licenced hotel but the Manager is agreeable to our bringing in alcohol provided we keep it to our rooms and the lounge provided for us. A night porter will provide tea or coffee. Breakfast is normally from 8 - 9.30, but as a concession this has been extended to 10.30. If anyone would like to insure articles of value, John Newman, 36 Bulstrode Ave., Hounslow, Middx., will take care of any inquiry. Auction material to Ella Parker. Convcntion fees to Archie Mercer, 434/4 Newark Rd., North Hykeham, Lincoln. These have now been reduced to: BSFA Members 7/6, junior members 5/-; Non BSFA members 10/-, junior nonmembers 7/6d -- for the entire convention. This is a BSFA Convention and is not being organised in conjunction with the London Circle. LYNN HICKMAN (3O4 N.11th., Mt.Vernon, Illinois,USA) reports that the 10th Anniversary issue of JD-ARGASSY will be published in May, a 70 page issue for 50cents, with material by Harry Warner, Dean A. Grennell, Rog Phillips, Bob Tucker, Bob Madle, Sandy Sanderson, John Berry, Earl Kemp and Charles de Vet amongst others. Interested fans in Britain may obtain this argosy by sending British agent Ron Bennett three shillings and sixpence. APORRHETA No 15 (Sandy Sanderson, “Inchmery”, 236 Queens Road, London SE l4; 50 pp; 1/6 or 20cents per copy, 6 for $l or 8/- , l2 for $2 or 15/-). With the latest Ape, Sandy switches back to black ink and conjures up micro elite type for the editorial and as one who suffers from eyestrain, I’m pleased that the use of the small type is indeed limited. 24 pages are given over to a highly interesting Inchmery Fan Diary, but pride of place must go to a competition set by the literary minded Vince Clarke, the funniest fannish idea I’ve seen produced in a long time. George Spencer contributes a fan story, John Berry writes an American adventure, and Andy Young asks “What’s Wrong With SF?” Regular columnists Joy Clarke, Cantaloupe Flabbergaste, Penelope Fandergaste, and Dean Grennell are here in force. Joy’s “Li’l Pitcher” concerns itself with general chatter, including a nicely thought out development of Hemingway’s having a cash register attached to his typewriter (Ha! Caught you, Joy Clarke! Boucher first used the idea in ”Rocket To The Morgue.”). After criticising the Apa, Cantaloupe suggests that the. BSFA forms one. PF salutes the Los Angeles group, a worthy sentiment, and quietly tears Ted White to pieces. Grcnnell coins words (a wonderful piece). Arthur Thomson moves his A to Z from S to W. Sandy provides a TAFF platform for all three candidates. A slightly below standard Ape, which is to say merely brilliant. TRIODE l7 (Eric Bentcliffe, 47 Alldis Street, Great Moor, Stockport, Cheshire and Terry Jeeves, 58 Sherrard Grove, Sheffield 12, Yorks. 1/6 or 20cents per copy, 4 for 5/. or 6 for $1.38pp. U.S.subs to Dale K.Smith, 300l Kyle Avenue, Minneapolis 22, Minnesota). This issue kicks off with a too short editorial by Eric. John Berry is present with the account of the Berry Two Stage Rocket. Harry Warner pictures the homes of fen from their addresses (I wonder what he made of Donaho’s Nunnery!) Terry Jeeves writes for four pages, mostly on the recent LaSFaS party. Penelope Fandergaste spills over her Mill Stream to discuss dreams and several million BNFs make up the letter column. The artwork and layout once again deserve special mention. It used to be said that TRIODE was too formal and staid, but these days the zine is a quarterly which does not appear too often. Shucks! Almost forgot to mention Doc Weir writing on filming Tolkein’s “Lord of the Rings” in England and George Locke writing on tiddly winks in fandom, which just goes to show how good the rest of the magazine must be. CACTUS No. 3 (Sture Sedolin, Box 403,Vallingby 4 ,Sweden. 17pp. 7/- for no fewer than 10 issues to Alan Dodd, 77 Stanstead Rd, Hoddesdon, Herts.) Duplicated entirely in red, this issue maintains the improvement shown in the second issue, and is noteworthy for the pen pictures presented by John Berry which show Inchmery fandom in a deservedly good light. 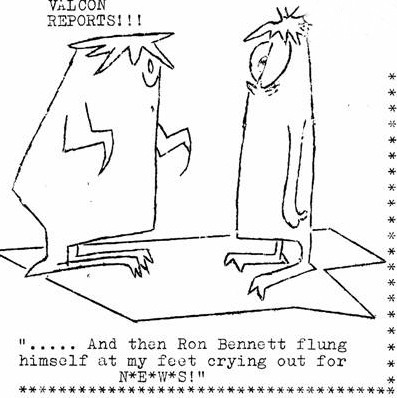 Ray Nelson contributes some good cartoons which are spoiled somewhat by the duplicating. Bob Lichtman reviews fanzine. Terry Carr writes on jazz. Try this one. THE CHELTENHAM VALCON made fannish history by burning itself out in an unusual manner. Archie Mercer reports that the paraffin heater caught fire at Bennington Street. “Eric (”I’ll do it - I sell those”) the Bent assumed control. “Ten minutes or so later he was still in control and the thing was flaming brightly. Man, that was the SMOKE-FILLEDEST room ever,” writes Archie. Ha! KEN CHESLIN, leading light of the Stourbridge group, rececntly suffered an accident at work, resulting in the loss of three right hand fingers. HALF A DOZEN fans have already voted in the TAFF’s Pittcon Push. If this campaign, to send a British delegate to the September Worldcon, is to be successful, we’ll have to do better than that. Move! Meanwhile, America’s TAFF delegate to the Eastercon says that he will fly jet to London, arriving April 9th. *** The TAFF auction at the Eastercon will include 5 Nova covers by Brian Lewis, from NEW WORLDS 7l, 74, 79 and 82 and SFA 11. Postal bids are invited. THE DIRECTORY OF 1959 SF FANDOM (1/9 or 25cents from Bennett or Pavlat is still selling. 500 fan addresses, tape and phone listing. TED FORSYTH (139 Buccleuch Street Edinburgh 8) writcs on his recent trip to London,”If you read SKYRACK you’ll have noticed that I had a visit to London coming up. I left Edinburgh early on Wednesday morning, 27th Jan and arrived back on Monday evening, 1st Feb. I spent two nights in Woking with relations and stayed Thursday, Saturday and Sunday at Ella Parker’s. During this time I managed to put faces to quite a few fans who had been only names and in the process enjoyed myself immensely. London looks like the inside of a train, I seldom seemed to spend more than a few minutes on the surface and when I did it was usually at night. On my way home I passed through Harrogate, but I did not see you. Was it something I said?" ALAN RISPIN hitched over to Harrogate for a brag session Feb 7th and caught the train back. Hmm. *** Norman Shorrock has had a card from Boyd Raeburn in Puerto Rico *** Liverpool University Rag Mag runs photo of Assistant Editor Bill Harry on contents page.